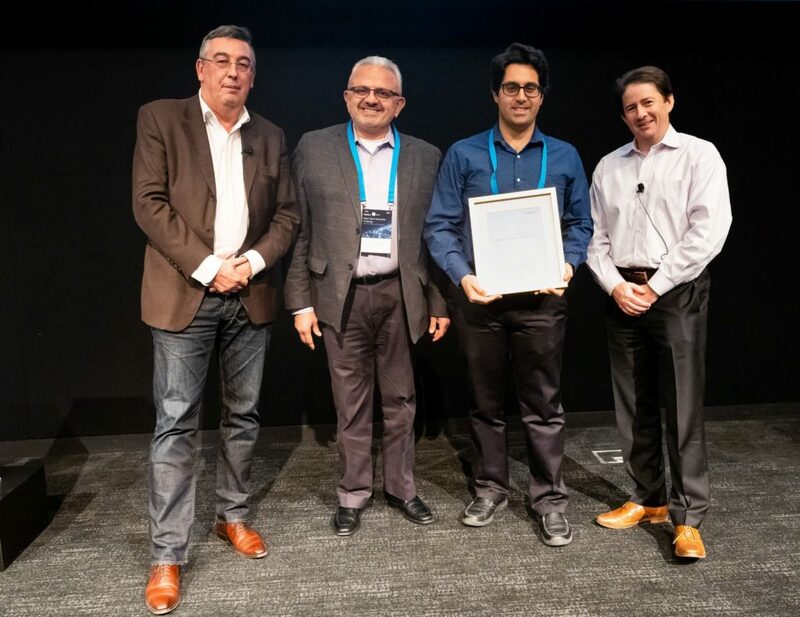 Montreal, Canada – SPARK Microsystems has been named the winner of the Nokia Open Innovation Challenge (NOIC) 2018 for its ultra-low power and ultra-short latency wireless transceiver technology. In addition to the US$100,000 grand prize, SPARK Microsystems will have an opportunity to collaborate with Nokia and Nokia Bell Labs resources to deploy its unique wireless platform. Jean-Luc Beylat, Fares Mubarak, Frederic Nabki and Marcus Weldon. Based in Montreal, SPARK Microsystems stood out from more than 300 startups from all over the world. This year’s competition focused on products and solutions for industrial automation and the Internet of Things. 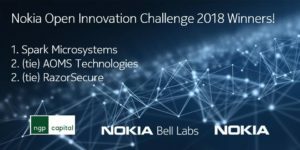 Participants went through two rounds of evaluations and the top six finalists were invited to present their technology to an international jury panel at Nokia Bell Labs. The jury was led by Dr. Weldon and comprised of leaders from across Nokia, Nokia Bell Labs and NGP Capital. SPARK Microsystems is a fabless semiconductor company that is leading the way towards ultra-low power wireless communications for the Internet of Things revolution. With its patented technologies, SPARK Microsystems will bring to market a high performance wireless transceiver that allows for orders of magnitude improved power consumption and latency while providing higher data rates than competing technologies. For more information, please visit www.sparkmicro.com. Nokia Bell Labs is the world renowned industrial research arm of Nokia. Over its 92-year history, Bell Labs has invented many of the foundational technologies that underpin information and communications networks and all digital devices and systems. This research has resulted in 9 Nobel Prizes, three Turing Awards, three Japan Prizes, a plethora of National Medals of Science and Engineering, as well as an Oscar, two Grammy awards and an Emmy award for technical innovation. For more information, visit www.bell-labs.com. We adhere to the highest ethical business standards as we create technology with social purpose, quality and integrity. Nokia is enabling the infrastructure for 5G and the Internet of Things to transform the human experience. For more information, visit www.nokia.com.